Two Halloweens ago I was invited to a party that required everyone to participate in a jack-'o-lantern contest. My carving abilities are mediocre at best, so I had to think up something that would at least place me in this contest (yes, I am competitive). A few days before the party I went to Holiday Farm's farmstand on Route 9 in Dalton, Massachusetts, which was overflowing with squash and gourds but not so many pumpkins — they only carried sugar pumpkins for cooking. I was about to leave empty-handed when this big orange squash with a unique shape caught my eye. I thought "The odd-shaped top of that squash will make for a conehead-like effect on my jack-'o-lantern. Perfect!" I picked up the heavy squash and brought it to the woman working at the farmstand to pay for it. The woman excitedly began telling me that it was a delicious and rare heirloom variety, and then she asked what was I planning to use it for. She was appalled by my response. If I recall correctly, she was a student in agricultural school doing an internship with Holiday Farm, and she was very proud of her produce. She certainly never intended her squash to be used as a Halloween prop or to be carved to bits and not eaten! She managed to regain her composure, and she asked whether I gardened. I told her that I had just grown a few things in containers that past summer, but that I intended to start a small garden the following season. Her excitement returned, and she recommended that I save these seeds — after all, they were rare heirloom Boston Marrows. I took her advice and tediously picked, rinsed, dried, and enveloped hundreds of seeds. Only to forget about them when I did start my garden last year. Three weeks ago, I began starting some seeds indoors for my expanding garden this year. 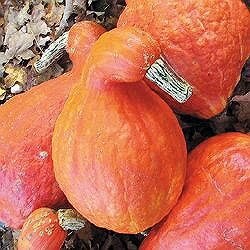 And I remembered that I had these squash seeds. I don't really think squash are supposed to be started inside, but I wasn't sure if these seeds would work. I've never saved seeds before and didn't read up on the proper method before I did it. They had been in a drawer in the kitchen for a year and a half. Despite the odds against their success, I decided to give them a try, and I planted nine of them in small containers. I then placed them under grow lights in the basement. They worked! As a matter-of-fact, they surpassed (in growth) all of the other seeds that I started that day (peas, basil, parsley, and sage). Heirloom Boston Marrow Squash growing in my basement. All of the seedlings under the fluorescent lights in my basement. Notice how the Boston Marrow (front right) towers over the others. the same day as the Boston Marrow. I am looking forward to transplanting them into the garden. I think I may start a few from seed in the ground too. I'm very excited and hope that I can harvest plenty of them. From what I have read, they make a better "pumpkin" pie that actual pumpkins do. Look out family, we're going to have some tasty dessert this Thanksgiving! Oh, and to all my friends, family, and co-workers who garden — I have plenty more of these seeds. If you want some, I'll be happy to share. In case you were wondering, I tied for third place in the jack-'o-lantern contest. This was all due to my Boston Marrow. I won for originality, not my carving talent.